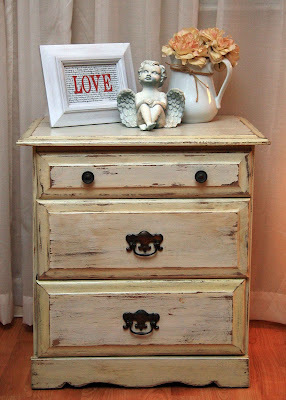 Valentine's Day came early for me when I spied some gorgeous nightstands in my friend Kate's space at Country Roads. I made a little mention to her that maybe she should let my "cupid" know about them. Well being the good friend that she is, she did, and guess what showed up at my door today?! I realize not everybody is into the "shabby" look, but these are vintage and I just love them. Unfortunately, it may have prompted a little (or possibly big) bedroom redo, as Rick and I both looked at our new nightstands in our room and said, "We need a new headboard." Our bedroom furniture belonged to my grandparents and is really beautiful and in great shape, but it's from the 60s, a laquered oak finish, and really just not my style. I decided to add a little Valentine's vingette, complete with a new printable. The sweet little cherub was a gift from my friend, Kate﻿; another "I spy" from her blog. I had a vision for this a while back, and decided it would make a great printable for Valentine's day. 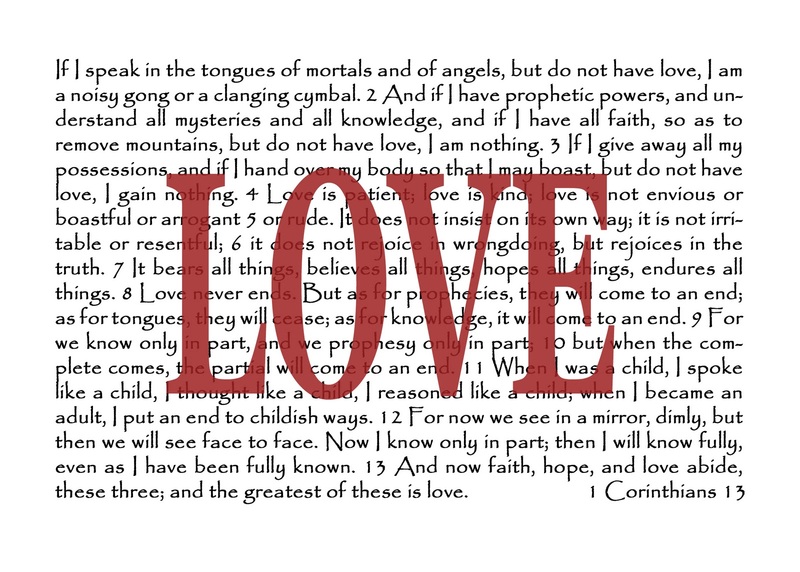 It has 1 Corinthians 13 (the love chapter) in the background, and the word LOVE in a transparent red. If you like it, it's free for the taking. Size is 5"x7" (I actually reduced mine a bit to fit in a 4"x6" frame I had). As always, just right click and save. I've got a big blog project coming up in the next few days...I'll be unveiling something new...don't you want to know what it is??? Come back this weekend and check it out! I LOVE the nightstands! Gorgeous! I love the distressed look. The printable is beautiful, too. Can't wait to hear about this blog project. As always, thanks for sharing your great printables! And can't wait to see what the project is! It all looks great together! *Love* the printable! I'm featuring this on my blog today. I love this!! I have been able to make so many gifts from the stuff you've been posting. I used the one at Christmas, New Years and I'll be using this one too!! What a great 'vision'! It turned out so nice - and would make a very pretty card, too. Gotta love the vinatage furniture. It's made to last! The printable is so cute! I'm following you through the Weekend Wrap Up at Tater Tots & Jello! Oh wow, that night stand is amazing! The patina.. I have to go stare at it again. :) And the printable are pretty sweet as well! Those night stands are to DIE for and the printable is adorable. Just had to print it off right away! Wow I love this. Very simple but just enough detail to make a big statement. Saw this post on Show and Tell Saturdays. I love the dressers. Thanks for the printable! It is really pretty! Come link up to my Sew Crafty party & giveaway! Everything looks so good together! Thanks for the free bee!! 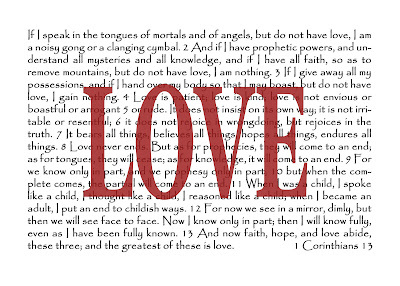 Love, love, LOVE the scripture verse behind it, and the fact that you can still read it through the "LOVE." Great job! Thanks for sharing ... I'll be linking. And please come join my party anytime! Thanks for sharing such a great printable! I found you through Tatertots and Jello's wrapup and featured your project on my blog today! Thank you for another great printable. What % reduction did you do to get it to fit into your 4x6 frame?I've printed a few in different sizes 100%, 90% 85%.After I get mine framed and posted I'll let you know.I'm also your newest follower. Found you through Funky Junk Interiors. I was just thinking I should start on Valentine's Day decorating but, not having a lot of time for crafting lately, I didn't have any good ideas. Your printable is perfect - quick and easy and it looks sharp. Thanks for sharing! Love the "LOVE" picture! Thanks so much! I know you will enjoy the nightstands. Show us how you continue to update your bedroom. Thanks for sharing your blog and the Love freebie. I am a new follower and can't wait to see the rest of your blog. Thank you for the LOVE download. Most important word in the Bible! This is really nice! Thank you so much. Thanks so much for the printables! I downloaded the Christmas tree one - it's precious - and I used the "Love" one from this post as inspiration to make a "Pray" one as a gift for the ladies in my prayer group. Found this on Pinterest, thank you for offering the printable! Used your printable for my 2013 Valentine's Day mantel. Check it out if you have a minute! Thank you!! So sweet! Thank you for this! I'm Doing Guest Post Double Time Today! So You Say You Want to Have Kids?